CDS - Online Retail Sales - Carmen's Distribution Systems, Inc. 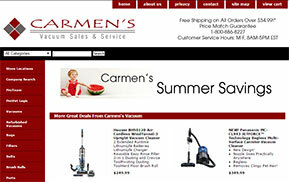 The home of Carmen's Vacuum on the web. 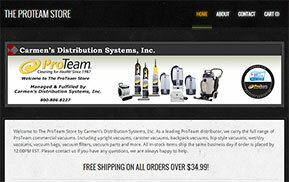 On this site you will find our selection of residential cleaning equipment and supplies. From brands like Miele, Riccar, Panasonic, Reliable, Jiffy, Hoover, Royal, Electrolux, Eureka, Koblenz, ProTeam, Windsor, NSS, General, ICE, Bissell, Dirt Devil, Beam, Cana-Vac, Buckeye and many many more! The ProTeam Store was created in partnership with ProTeam. We are the largest ProTeam Distributor in the country. As a result our staff are experts at finding the right ProTeam machine for your unique needs. From Backpack Vacuums, Upright Vacuums and Canisters to a full selection of bags, belts and parts. We have you covered. 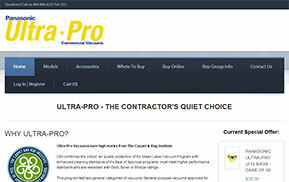 Our Panasonic Ultra-Pro site was created in partnership with Panasonic. We are the exclusive Panasonic Ultra-Pro Distributor in the world. As a result our staff are experts at finding the right Ultra-Pro upright vacuum for your quiet cleaning needs. Ultra-Pro Vacuums are CRI, RoHS & LEED Certified and Shaw Carpet Approved. The Wessel-Werk Store was created in partnership with Wessel-Werk. Our staff are experts at finding the right Central Vacuum Accessory or Premium Power Head for your healthy home. High quality materials, innovative technology and attractive design coupled with the proverbial WESSEL QUALITY create the uniqueness of the Wessel products. Innovation is the engine driving their success. This our newest site and is expected to grow over time. As always, your feedback is welcome as this site evolves.